A grandad has been given the old toilet he used as a young boy. 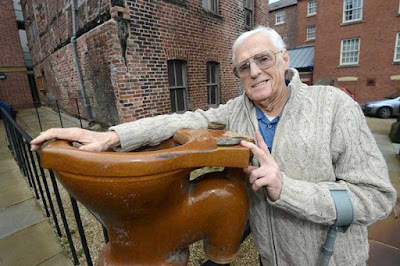 Harry Littlewood, 68, has been reunited with the loo that was uncovered by workers at the council’s £45million Redrock development in the centre of Stockport, Greater Manchester. He grew up in the area, which had rows of cottages built in Victorian times, and made a nostalgic visit to the site when building began last year. Contractors had uncovered the remains dating back to this era and Harry recognised one of a row of three toilets as his former lav. Harry asked if he could have the toilet and when Stockport Council agreed he was presented with it. Harry said: “It was the one I used when I was a nipper 60-odd years ago, I never thought I’d see it again. “I can’t really use it as a fruit bowl so I’ll probably give it pride of place in the garden and use it as a planter. It brings back some memories. Using it in winter was certainly not pleasant when the pipes froze but you tend to remember the warm summer days more.” Harry, who has two daughters and four grandchildren, lived in the Bridgefields area from 1948 to 1959. He was given a tour of the site and initially recognised the toilet because it was still in the same location as he remembered it. Councillor Martin Candler, executive member for supporting places, said: "It was lovely to have the opportunity to meet Harry and to be able to give him one of the archaeological findings that meant so much to him from his childhood."